New York may be the bagel capital of the country, but the Peach State also knows how to make a bagel right. 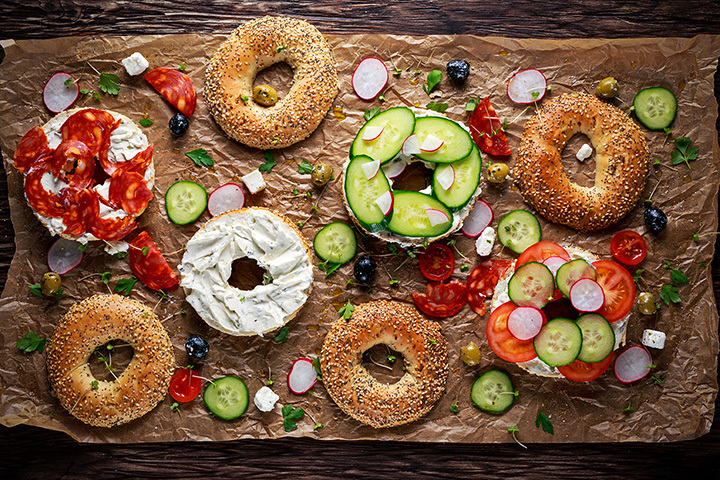 Throughout Georgia you’ll find some of the tastiest bagel varieties, complete with all your favorite spreads, sides, and toppings to fill you up and fuel your day. Find your favorite bagel at one of these 10 best bagel shops in Georgia. This deli and bagel shop will give the best bakeries in New York a run fortheir money. Here you’ll find a tasty variety of hand rolled, kettle-boiled bagels alongside other breakfast and lunch favorites. On display are some of the most beautiful cream cheeses (yes, cream cheese can be beautiful) and spreads to complement your bagel and give your taste buds the treat it’s been missing. If you’re searching for authentic New York-style bagels, you don’t have to travel to the Big Apple. This Jewish-style family deli and bagel haven offers a stunning variety of bagels and schmears, along with delicious lunch offerings (try the fan favorite white fish salad!). Don’t let the name fool you—this little bagel nook is found right here in Georgia, just 30 minutes north of downtown Atlanta. They specialize in authentic Brooklyn-style kettle-boiled bagels, in addition to deli sandwiches for lunch. If you’re going for the bagels, make sure you try the Rio Grande—you won’t walk away hungry! This family-owned bagel shop and lunch eatery specializes in creating the freshest bagels in town. In addition to traditional bagel flavors, you’re likely to find a new favorite with their honey wheat or cranberry orange varieties. Each them plain, add your favorite schmear, or enjoy them as a sandwich, like the Garden Bagel or Holy Jalapeno. And make sure you save room for dessert—you won’t want to miss a bite of their chocolate croissant! As downtown’s only New York-inspired bagel shop, guests can count on a fresh, delicious breakfast or lunch complete with their favorite style of bagel. They offer a variety of bagels, spreads, and other fixings to create a one-of-a-kind meal for every guest. A spinoff of local favorite Luna Baking Co., this bagel shop is serving up some of the freshest lunch in town. For breakfast, you can get your fill of bagels and all the spreads and toppings you can imagine. For lunch, consider pairing your bagel with a heap of Boar’s Head premium meats. Either way, you’ll discover that yes, it’s possible to find bagels in the south that are oh-so-close to New York standards. This local three-location bagel shop offers plenty for Atlanteans to look forward to each morning. The service is quick, the bagels are scrumptious, and the service is personal, despite being in the midst of a busy metro. They also offer exceptional smoothies, sandwiches, and sweets to complement your meal. Art’s fresh bagels make it easier to get moving in the morning. Here you’ll find some of the best New York-style bagels outside of NYC. They also feature delectable Boar’s Head deli meats to give you a tasty lunch experience that’s far from ordinary. These bagels will make you swear you’ve walked into a New York bagel shop. They’re also cooking up some of your favorite southern breakfast staples, like pancakes fresh from the griddle and farm-fresh omelets. They also offer an extensive sandwich selection for lunch, each of which you can have served on one of their bagels. Try them every day for a year and you won’t have to order the same thing twice! Bagel connoisseurs will agree you won’t find better bagels in Georgia than at Bagelicious. This casual mom-and-pop joint is serving up some of the freshest flavors in bagels, alongside Jewish favorites like Matzo ball soup, challah, and hamantaschens. They’ve also got plenty of Bagelwiches to make your lunch anything but boring.